That'll be much easier I think. Last time we chatted, you had said I'll need to "scuff" off the over-spray with a gray scotch brite pad. That still the case? Or.. does the master have still more to teach this Padawan learner? I'll have the Rum waiting for you!! The Spray Booth is about 1/2 done. 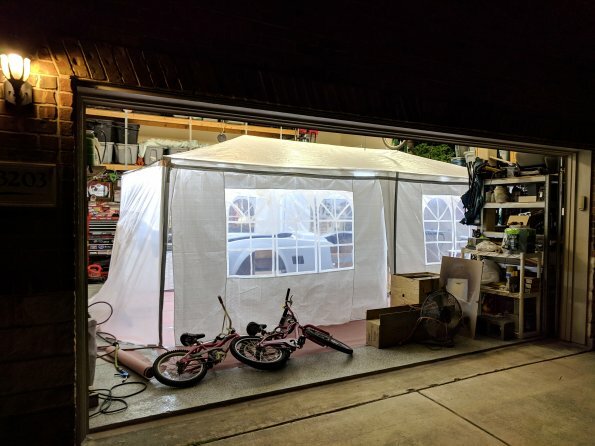 It's up, the seams are all sealed with duct tape, and a bunch of led strips for added lighting. The leds, along with the main shop lights.. and ... the ambient light from the open garage doors (I'll be spraying during the day) provide plenty of light to see what I'm doing. There's more light than it looks in the photos due to the auto white balance of my phone camera. Still need to seal in my blower fan and the hvac filters. That'll be tomorrows project. Tonight.. Beer-o-clock. Going to spray the underside of the hood, scoop and trunk this weekend. Then.. next weekend... the rest. Cant wait to see color!! Jus cuz I taint sed nuttin don't meen I aint got my I on you boy ….Good shootin brother. Just ordered this from Amazon. 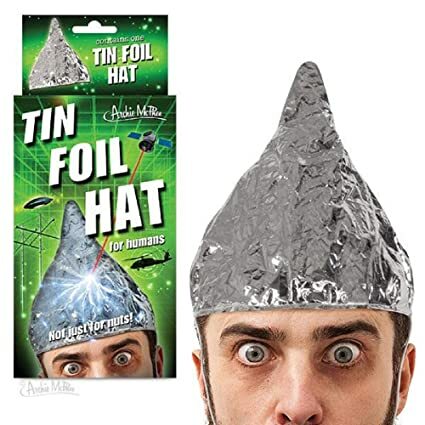 It says will render the wearer totally invisible to all people named Jeff. I should be safe now. Ok... I need some EMERGENCY help. 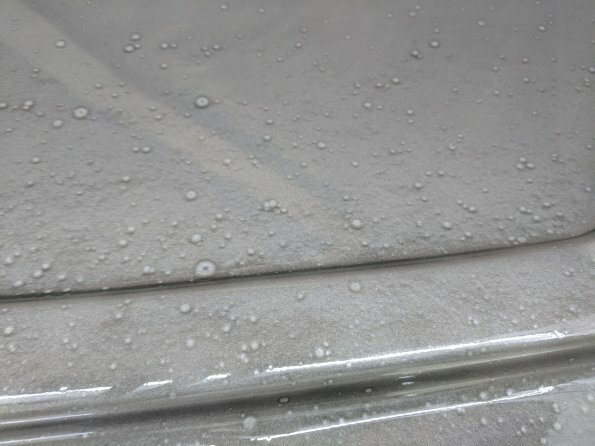 I just put coat #1 on the bottom of the hood trunk and scoop. I need to know what to do at this point. I sprayed the hood first, got a few, the trunk 2nd got a FREAKIN' CRAP LOAD, scooop; 3rd and got just a couple. And, one of those cheap disposable filters at the gun. I pre-paint wiped down all surfaces, then tack-clothed them all. Is this crap I left behind on the panel? Or .. something in my air line? What do I do? I'm going to need to stop, let it dry, and sand it, right? Of all the things that could go wrong.. this is the worst case scenario. Last edited by skidd; 02-23-2019 at 03:03 PM. I called a buddy of mine who has far more experience than I have. Showed him the pic, asked for guidance. He said. "stop... let it cure, sand it and start over again". I was not happy with this advice. but.. I made my bed.. time to sleep in it. I asked him.. nothing else I can do huh? he said.. "well.. uh.. yeah. .no. I mean.. uh.. well.. No". ?? I heard that.. what are you not telling me. He said.. I have tried something with marginal success . If you try it, it's all on you. he said, try a few light "dusting" coats over the fish eye. See if it starts to cover it. If it does, go ahead and try a normal coat after that. It will NOT fill the craters, but it "might" emphases on "MIGHT" cover the fisheyes. So.. I figured.. .if I'm going to have to sand it worst case.. I'll try this first. It pretty much worked. Actually better than he lead me to believe it might. The fisheys did leave small craters, but at least it's the under-panel surfaces. I actually have to look close to see them, but they are there. Good news: at least I don't think I can blame my air supply. Bad news: clearly I didn't do a good enough job cleaning the surface. Good news: It's the under panels that this happened on, and I can live with that. Bad news: daBat and Kleiner are going to see this soon.. and I'm gonna git'it!! I'd have taken it off rather than trying to bury it... I'm going to leave this one to Dr. Miller because he's the chemist (in spite of the fact that I like blowing smoke up his skirt he's one smart guy and you can take his advise on problems like this to the bank). Lots of things could have caused it so the big concern is what. Compressor blowing oil? Contamination in your hose (my paint hoses only get plugged into air that's been through the dryer/separator, never the regular shop air)? I don't think it's residue left from a final wash cleaner---in my experience that will craze rather than fisheye. It will be interesting to see what daBat has to say. Got ahold of daBat on the phone.. and he talked me down from the ledge!! Good news is, he's fine with the "cover it up" I did. Especially given they are under panel locations. We went through how to avoid it happening next weekend when I do the rest of the car. In short... I need to "wash" the whole car again. We both more-or-less agree it was something on the panel, because I'm getting no more fisheye after that initial one. So, it's almost certainly not in my lines. (fingers crossed). Plus... I didn't put down sealer on these underside panels, while I intend to put down sealer on the main surfaces next weekend. Technically, that gives me a layer of "oops" to recover from. 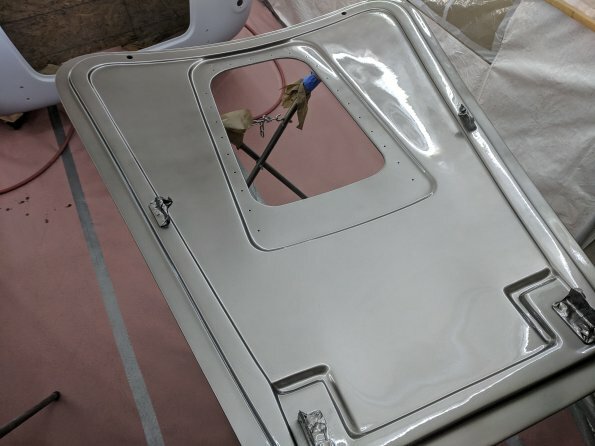 Here is the result of my "dusting" repair, and 2 coats of clear (2 more to go). I'm really quite content with it .. again.. given it's under the trunk afterall. Last edited by skidd; 02-23-2019 at 07:49 PM. The clear I went with was the PPG Vibrance Line. per yer recommendations. See.. I do sometimes listen!!.. sometimes. I mixed up 16oz of the stuff, and figured I might as well use it since I can't save it. Hope I don't get these micro-pops ya speak of. coat 1 was pretty light. I might have been a bit paranoid from the base color fish-eye, so I went a bit light to start. coats 2,3 and 4 were pretty wet. It's all been baking in my garage with the heater set on max (30c/85F) for about the last hour. Looks pretty good so far. A ittle bit of orange peel in a couple of places, a couple of dust specs.. but most of it seems to have leveled out pretty nicely. Actually.. the problem spots on the trunk surface.. where all that fisheye was.. looks almost the best! Whodathunkit. I looked as close as I could, and couldn't find the fisheye craters. Would I see these micro-pops by now? Because as of this morning, the under panels look really good! A few dust particles which have introduce tiny "bumps" in the finish, and a couple of minor orangepeel spots. and what looks perhaps like a spot of tiger-stripe right beside the scoop opening (see pic). But, no bubbles under the surface anywhere. Did I escape this round relatively unscathed all things considered? Truth be told, except for the handfull of dust bits, these panels turned out fantastic. 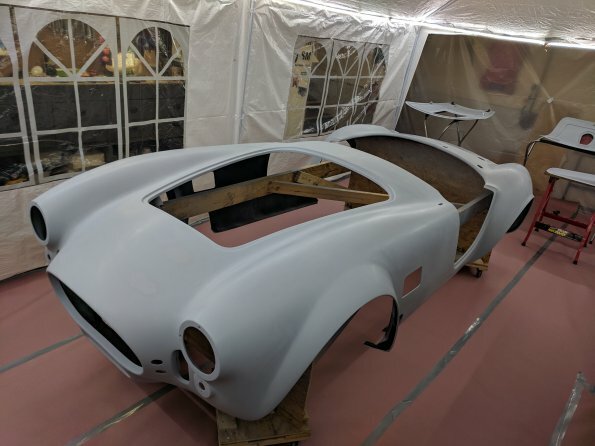 Despite the trunk looking like the face of the moon after coat #1. I looked as close as i could, and I can not find any of the fisheye craters or anything. 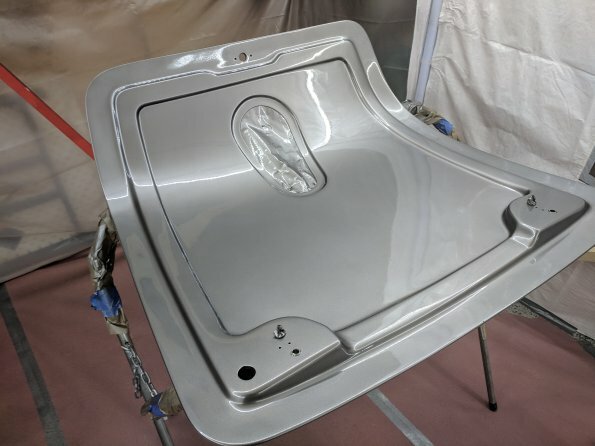 Hey.. when It eventually comes time to color sand the whole car... do these underside panel surfaces get wet sanded and polished too? Or .. to they generally get left alone? P.S. I'm absolutely in LOVE with this color!! There is no doubt in my mind I made the right choice. OH SHUT UP !! Yes you would see them by now. Best I can describe is kinda looks like sugar on the surface. God bless beginners luck.....but now that you have used it all up on the bottoms (WHO DOES THAT ) be mindful of all we have talked about. 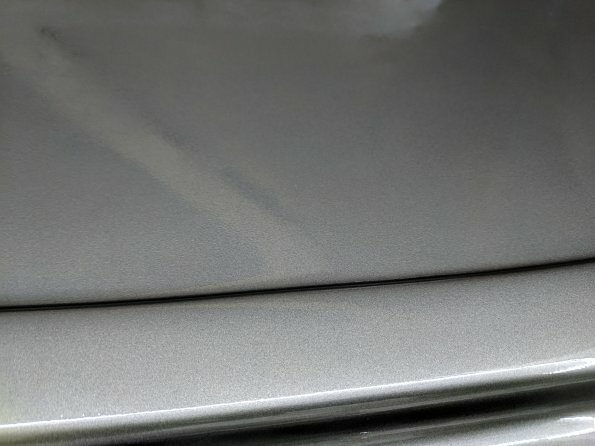 I do nib and polish the bottom of the hood but not the deck lid (cause it's not my car and I don't care). It's really up to you......god knows ya got enough material ta work with under there ! Stay in touch brother. I will try to be available to you on paint day ….answer questions, hold your hand, talk you down from the ledge,,,,,,OH LOOK ! HE'S LAYING IN THE DRIVEWAY MAKING "GRAVEL ANGELS".....FACE DOWN ! ….I wonder what went wrong. Yeah, it's like that ! A wise old sage once told me... "Beginners Luck is the reason seasoned professionals give for newbs proving that any joker can actually do their job". Seriously though.. thanks for the help Miller. I was freakin' nervous as hell right before pulling the trigger on the first coat. I've dropped a pretty large chunk of $$$ on this paint, and screwing it up was going to hurt. I think I stood there with the gun aimed for about 2 minutes before I grew the coconuts to pull the trigger. Then to see that fisheye fiasco.. I thought I was toast!! Pulled that one out of my a$$. I have my next weekend planned now. Weather permitting. Monday: Go see doctor to remove rocks from face after making gravel angels. Stop to buy more beer on the way home. If you're going to do it like the photo I use a different sequence---spray the pinstripe color, mask it, spray stripe color, mask it, spray primary, unmask, spray clear. Everywhere you see a comma in that sentence add beer. Don't forget to also add it after clear. Now, I know my friend Miller does it differently...instead of adding beer at every comma he adds rum. Geeze! Did you and Miller buy the same defective respirators? I grew up in my Dad's body shop, I know the symptoms. All kidding aside, you're doing a great job! Respirator? is that a thing? kidding. Not sure if we got the same defective respirators, but I'm pretty sure we've been drinking from the same defective rum. PPG-DT885 right? same rum you drink right Miller? Thanks for the props though. I'm havin' a blast learning this as I go. This is what my inspiration is. Slightly different colors, but this layout. So.. silver pin-stripes around the main black stripe. In my head, as I imagine laying out the masking, it always seems easier to do the black, then the silver. But, I also know full well that putting black on top of silver is far easier than the other way around. silver -> black -> main color? black -> siver -> main color? The thing I like about putting down the silver first, is it seems easier to mask that stripe, and slap down the black on top of it. Then, just add to the mask after laying down the black. Though, I sure as hell have to get the placement of the masking tape perfect. Where as,building out the mask from the black, out to the silver seems less prone to error. Dang you freakin' painters. Dang crazy bunch. the whole lot of you!! Oh god no ! I never drink reducer...…..I'm 60. I have to drink "Hardener"...…..unless it last for 4 hours...…..THEN YA DRINK THE REDUCER !......there's a saying. Hardener before reducer you'll never get looser. Reducer before hardener , you're gonna owe her an apology. So, I know it doesn't rhyme but I didn't just make it up......I didn't.....NO I DIDN'T...……….I'M TELLIN MY MOM !!!! Anybody have preference/opinion on stripe taping sequences? Both of these seem perfectly viable, and one seems a touch easier and less error prone. lots of that 3m blue tape from Home Depot. roll of general purpose brown masking paper. Spray black primary stripe color. Cary to approx to body gullys. Pull 36mm (1.4") 3m green tape line down center of entire car as guide. Pull 1" blue vinyl tape beside center guide tape. Remove 36mm center guide tape. Measure out to other side of both stripes. Pull 1" vinyl tape at outter edge measurements. Pull 1/4" vinyl tape at exact edge of black masked areas. Measure out and Spray silver down center and outside edges. On top of pin-stripe tape, tape and fill black main stripe. (silver and black are all covered. Option 2 somehow seems less error prone to me. If I spend the time and effort to perfectly lay out the 4 pin stripes. and I mean PERFECTLY!! Then masking the black is easier because I just have to run tape on top of the pin-stripe masks. No need to try and get a run of tape perfectly beside another run of tape. If I do go option #2, (which I'm leaning to)... is it worth running a bunch of brown masking paper on the outer edge before spraying the black primary stripe? In an effort to keep from trying to cover "black" with "gray"? And .. to keep any over-spray down too? Or .. just spray the black to the body gullies and let teh gray do it's thing on top of the black? Just a bit paranoid about trying to cover that black paint with the gray paint. C'mon, man, spray the thing already! Ok, just kidding, had to get that out, Whew. Thanks. Oh hell go with #2. I wouldn't use vinyl tape to pull the center (too stretchy) I use 1" blue painters tape for that. Doesn't stretch and it's lower tack...da bat......I wouldn't go with # 2 either but I want to see if you still have the "luck"
I'm ahead of schedule today, and the weather is good. 55F outside, but a nice 70F in my garage with the heater running. So.. Planning now to get the sealer sprayed on in the next hour or so. Let it dry enough... then the 1st stripe color. Then, tomorrow morning 1st thing, I'll spend the time necessary to lay out the stripe masking. Since a cold-snap is in the forecast for Sunday, this should work out well. Sealer went on nice. No orange peel, can't see any overspray (not that I have an expert eye) , and most importantly... NO FISHEYE!!! Now, beer break while I let the sealer dry enough for the pin stripe color. Good luck today. Waiting for pictures! Stripe masking went pretty well. Took a bit over 3 hours to lay them out. Both primary and pin-stripe colors went on pretty well. Now, I'm waiting until the stripe color is dry for final masking.